Do You Have A Cricut Project of Your Own You Would Like to Share? Your own Cricut project can be part of the Crafts For All Seasons website! This site is all about sharing unique and creative craft ideas, and we would all LOVE to see what you have done using your Cricut. Your project will be on its own page on this website. You may link to it, and see what others have to say about your craft. A link to your project will appear below and also on the Cricut craft page. Your project will also be featured at the top of the home page for a limited time. Your Cricut project must be your own idea, or your own variation of a project, and it must be made by you. You must include a photo of the finished project to be accepted. Please make sure the photo is your own so that I know I have permission to post it. If you have a craft website or blog of your own, I will link to your original project page or home page, but the full instructions and a photo must also appear here. Please resize the photo to 800x600 pixels. Try www.picnik.com for an easy way to resize your photo. Then, list the materials needed for the project, the cartridge used, and cut sizes. Thank you so much for submitting! Please Note: By submitting your project, you are agreeing to allow your project to be featured on the Crafts For All Seasons blog, the RSS feed, and the Crafts For All Seasons Facebook page. These are all places where I announce new projects/additions/and updates to the site. 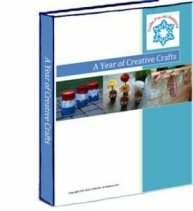 Crafts For All Seasons has the right to not accept a project submission. Your project instructions will appear on a Web page exactly the way you enter it here. Begin by telling us what materials were used, the Cricut cartridge(s) used, and the cut sizes used. To add your project photo, click the button and find it on your computer. Then select it. Please resize the photo to 800 x 600 pixels. A picture is required for acceptance. YOUR Cricut Projects are Here!